The Almudaina Royal Palace, facing the Cathedral on the ancient city walls, was built after the Catalan conquest in the XIII century, modifying the ancient Moslem fortress. 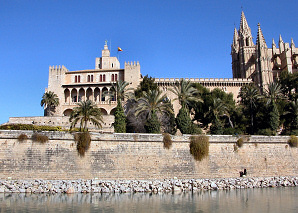 During the XIII and XIV centuries it was the residence of the Kings of Mallorca and afterwards the viceroys and governors. In 1963, the restoration of the castle was begun and now it is used as a museum plus the official residence for the King of Spain for official State Ceremonies and receptions in the summer. The building has a square shape and stands out particularly for its façade and terrace with excellent views over the sea, plus the Homage Tower crowned by a statue of the Archangel Gabriel. Inside the most outstanding elements are the Patio del Rey, the Gothic chapel to Santa Anna, the Throne Room, the Queen's Patio, the Sant Jaume chapel and some Arab baths. As for the interior decoration worth mentioning are some of the tapestries and furniture of different eras. Visiting hours: from Monday to Friday 10 a.m. - 1.15 p.m. and 4 - 5.15 p.m. (October to March) and 10 a.m. to 5.45 p.m. (April to September). Saturdays and holidays 10 a.m. - 1.15 p.m. Closed Sundays. Check prices at entrance. Free access for EU citizens on Wednesdays. More information on telephone 971214134 or the Palace web..